For the first time since this general election campaign began in early June, Republican John McCain attracted virtually as much media attention as his Democratic rival last week. Barack Obama was a significant or dominant factor in 81% of the campaign stories compared with 78% for McCain, according to PEJ’s Campaign Coverage Index for July 28-Aug. 3. Not only was that a high water mark for McCain in the general election season (his previous best was 62% from June 30-July 6). The virtual dead heat in the race for exposure between the two candidates also marked the first time his weekly coverage had even been within 10 percentage points of Obama’s total. Indeed, in the eight weeks since early June when the general election contest began, 79% of the stories have significantly featured Obama, compared with 55% for his Republican rival. The spike in press attention to the McCain campaign came a week after Obama’s tour of the Mideast and Europe commandeered the headlines, accounting for half the election coverage for July 21-27. It also came a week after the media engaged in a spasm of introspection, amid a wave of accusations that the media was being unfair to the GOP standard bearer. 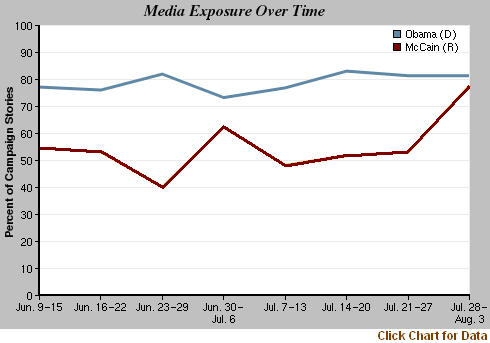 The third biggest campaign storyline for July 21-27 was the issue of whether the press was biased toward and lavishing too much attention on Obama. The “celebrity” spot also helped push campaign advertising to a more prominent place in the coverage than before. Advertising was the second-biggest campaign story line last week, filling 10% of the campaign newshole. And the ripple effects were felt throughout the week. The ad generated another narrative—whether McCain campaign was too negative—that filled 6% of the newshole. The tone of the campaign, and the new McCain ad, then triggered a third major story line. When Obama accused Republicans of trying to frighten Americans because he “doesn’t look like all those other presidents on those dollar bills,” the McCain team responded by accusing Obama of playing the “race card.” And that controversy, at 15%, became the biggest campaign narrative of all. In total, the chain of events set in motion by the celebrity ad accounted for almost one-third of the campaign coverage last week. 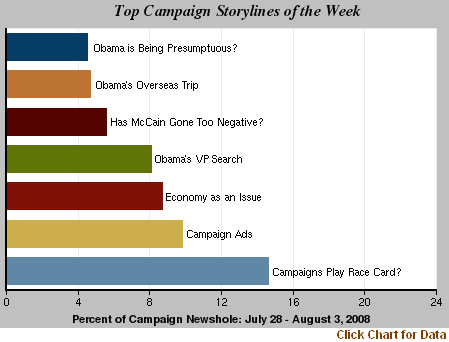 Hence McCain’s attack advertising strategy, which played off the notion that the press was infatuated with Obama, and blended it with the McCain theme that Obama offered less than meets the eye, drove the media narrative last week. Stories about vice-presidential picks, fueled by speculation that Obama might select Virginia Governor and fellow Harvard Law alum Tim Kaine, accounted for another 9% of the campaign newshole. Also at 9% was the policy debate over the economy as Obama convened a summit of his fiscal advisors and McCain hammered away at the theme of increased oil drilling as a solution to energy price inflation. One story that could have dominated the week, had the news been bad, subsided (down to 2% of the newshole) after a mole removed from melanoma survivor McCain proved to be benign. In some ways, the media’s soul searching over its own role, and the resulting spike upward in coverage of McCain, were perhaps predictable. This had happened before, back during the primaries between Obama and Hillary Clinton. The week of Feb. 25-March 2, after Clinton complained about a pro-Obama bias and cited a Saturday Night Live skit to make her point, the press spent considerable time examining the possibility it was being unfair. And it followed that the next week, Clinton generated more coverage than her Democratic rival, reversing a trend of several weeks when Obama had been the top newsmaker. If the McCain camp was trying to force the press to recalibrate and rethink, in other words, there was reason to imagine it might have an effect. If the McCain camp faced some criticism of the Spears ad, it seemed to regain the offensive on the “race card.” It began after Obama accused Republicans of scaring voters and made the point that he does not look like other Presidents. The No. 2 and No. 3 stories for the week of July 28-Aug. 3 were closely related subjects. Coverage of the economy—at 5% of the overall newshole as measured by PEJ’s News coverage Index—was driven by the signing of housing legislation and news of a projected federal budget deficit of nearly half a trillion dollars. Next, at 4% of the newshole, was the subject of energy prices in a week in which oil fluctuated, gas dropped and Exxon Mobile reported record quarter profits of $11.7 billion. That was followed, also at 4%, by news of the indictment of Senator Ted Stevens, the seven-term Alaska Republican. Events inside Iraq constituted the No. 5 story, also at 4% of the newshole.